Details will be posted on our 2019 Events page. If you are interested in finding out more about the unit, or want to give it a try, contact the orderly at bgrey@zoomtown.com, or visit us at any of our scheduled events. We are always recruiting those with a desire to walk in the Confederate soldier's shoes. Company G, 5th (9th) Kentucky Infantry, C.S.A. 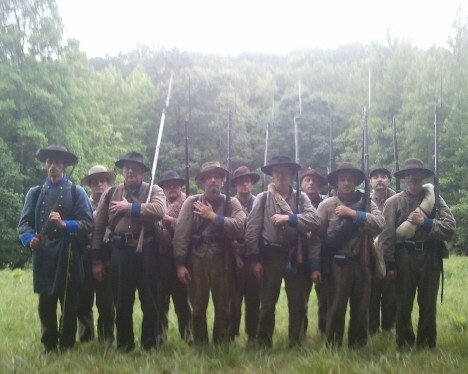 is a group of living historians based in Kentucky & portraying the common Confederate infantry soldier in the western theater of The War (for Southern Independence). This progressive mess (a group of soldiers who camped, ate, and fought together) wants the best reenacting experience possible–to experience what our ancestors lived. All or nearly all of us are members of the Sons of Confederate Veterans and have Confederate ancestors. What we do takes a lot of thought and effort, but what we gain through the experience makes it worth it all. Our goal is to learn from and teach each other, our unit, the reenactment community, and civilians (the public) about the cause and sacrifices of the Confederate soldier. Our cause, our flag, and our heritage are that important. Thanks to http://tennessee-scv.org/Camp1513/ for use of Confederate clipart. Unit members: Visit our forum.